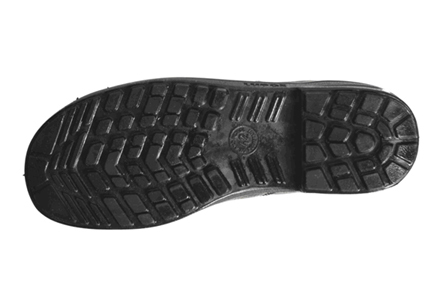 Two test persons, wearing standard test shoes, are used to determine the angle of inclination at which safe walking no longer occurs, after the pedestrian surface material being tested has been coated with engine lubricating oil. 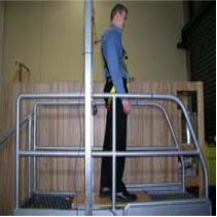 The test persons, each in turn, facing downhill and with an upright posture, move backwards and forwards over the test surface, as they increase their angle of inclination, until the safe limit of walking is reached. The angles of inclination obtained at such limits are used to assess the friction characteristics of the test surface. 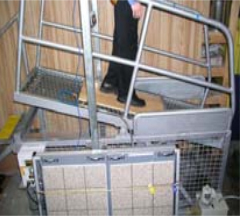 The mean acceptance angle obtained is used to assess the degree of slip resistance. Subjective influences on the acceptance angle are limited by means of a calibration procedure. It is not necessary for the test person to actually fall. NOTE: The test person may determine the limit of safe walking on their perception of when a further slight increase in inclination would cause a fall. The table below will interpret the results and the corresponding classification. Please note that this type of testing can only be performed in a specialist research test laboratory by those companies who have the equipment.